My introduction to the wonders of the skincare ingredient that is beta-glucan went something like this: I'm typing away at my desk and I'm over-caffeinated by one too many coffees (typical) when I receive an email about a new skincare line that I'd never heard of before called JKosmmune, and it's inspired by Korean beauty. All its products are made with naturally derived ingredients, including—you guessed it—beta-glucan. At this point, I know nothing about the skincare ingredient. I don't know where it came from, how it was derived, or even what it does. But nonetheless, I followed the spirit of unabashed Byrdie beauty editors and decided to test it out immediately. It's been about a month since that day, and I've used beta-glucan products exclusively. I've also learned a lot along the way. For one, I now understand what beta-glucan actually is. According to dermatologist Dendy Engelman, "Beta-glucans, written as β-glucans, are polysaccharides (multiple sugars, starch, cellulose bonded together) found in yeast, bacteria, fungi, seaweed, and grains like oats." You can ingest them in food or you can apply them to your skin. I was most interested with the effects of the latter, especially after reading internet accounts of people claiming that the ingredient boosted their hydration levels and skin barrier function, along with decreasing the look of wrinkles, redness, and irritation. Apparently those first-person accounts I read before launching into my beta-glucan skincare trial had real truth to back them up. As Engelman says, "some studies show that it helps in the treatment of dermatitis, eczema, bed sores, wounds, and burns." These reparative powers stem from the ingredient's barrier-boosting function. Take it from JKosmmune's President and Co-Founder Ann Son, who says the molecule actually links together on the surface of the skin to form a thin and undetectable film. This boosts the natural barrier, which protects "the sensitive skin underneath from daily environmental stressors." In other words, if redness and irritation are your skin's main issues (like they are for me), then beta-glucan is the new ingredient to try to cure it. What's more is that they fend off bacteria that could disrupt the skin's barrier even further. "Beta-glucans work by stimulating the macrophages (they work to fight off invading pathogens that can cause infections) and stimulate other immune cells to attack pathogens," Engelman tells me. "Think of them as ringleaders." For this reason, they're especially suited to people who have dry, rough, or cracked skin. "For those who have compromised skin barriers like eczema or dermatitis; beta-glucan can help fight virus and pathogens that pass through your skin barrier." According to Son, beta-glucans act as a humectant in the skin, which means they lock hydration in and prevent moisture loss. Here's where it gets interesting: Like retinol, hyaluronic acid is one of the beauty industry's most beloved and buzzworthy skincare ingredients since it's been found to hold up to 1000 times its weight in water, thus giving skin deep and lightweight hydration. It's certainly effective and important, though Son says that beta-glucans can do the same job—if not better. "Hyaluronic acid (HA) is very similar in structure, but it has subtle differences that make it less ideal," Son tells me. "Tests have shown beta-glucan is 20% more hydrating than HA at the same concentration. With extra water, beta-glucan can plump up the skin and make the skin feel more supple." Finally, Son lauds beta-glucans for their anti-aging effects. In fact, she says it's one of the skincare concerns that the ingredient primarily addresses (along with hydration of course). "Because it is a sugar molecule (a unique one), it can bind to many receptors in your body. Depending on where the molecule ends up, beta-glucan has different effects. In the skin, it acts as a humectant (holds moisture), as a collagen-booster (anti-wrinkle effect), and as an immune-booster and modulator, strengthening the skin barrier to ward off any intruders." One study even says that despite the comparatively large molecular size of beta-glucan, it deeply penetrates the epidermis to effectively plump up fine lines and wrinkles. I started out my beta-glucan skincare test by bringing a full JKosmmune routine with me as I traveled from Los Angeles to the snowy Midwest. Northern Michigan was my destination, and just for reference, I stepped off the plan to one-degree weather. Again, that was one degree Fahrenheit. Normally, going from balmy 60-degree L.A. weather to almost sub-zero Michigan winter temperatures makes my skin break out in patches of extreme dryness, redness, irritation, and even rogue oily spots. Basically, my complexion goes haywire, which is why I decided it would be the perfect time to test a new routine. I started by cleansing with the JKossmune Enzyme Cleansing Powder ($26), which wipes away dirt, oil, and makeup without stripping my skin. After that, I patted the brand's Toner ($26) all over my face to improve circulation and decrease long-term redness. Then it was on to the Serum ($46) and finally, the citrus-scented Lotion ($32). It was a simple four-step skincare routine that I did every morning and every night for a month's time. And it worked. Each of the products felt cooling and calming on my skin. The cleanser was effective and the toner was hydrating and balancing. The serum, though, was my personal favorite. It sinks into the skin after only a few seconds of contact, meaning it leaves no oily or greasy film behind. After, I use half, if not a third, of the face lotion that I normally would. One night I forgot to apply lotion at all—in the midst of a Michigan winter. That's never happened before, but it speaks to how superbly hydrating the serum feels. I don't know if it will continue to work for my combination skin when I return to spring and summer weather in L.A., but for wintertime, consider me hooked. When I asked how this level of hydration was possible, Son reiterated beta-glucan's powers. "Beta-glucan is certainly a powerful moisturizing ingredient, and it does the majority of the heavy lifting. We also utilize natural ingredients to maintain the hydration for longer, such as citrus oil and grape-seed oil," she said. "As hyaluronic acid (HA) grew in popularity, following the trend, we believe beta-glucan will soon replace HA as the next predominant skincare ingredient. The problem has been the enormous cost to manufacture—until our breakthrough manufacturing technology." 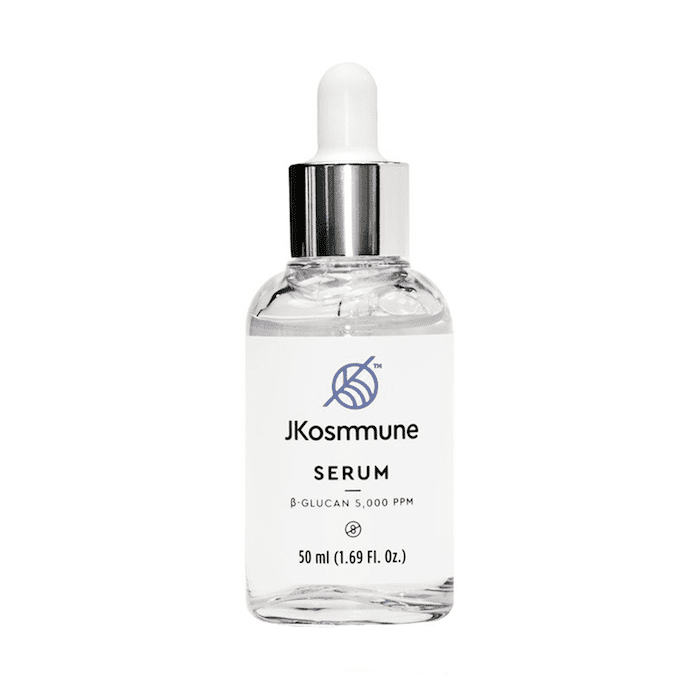 Although JKosmmune is at the forefront of the beta-glucan skincare trend, there are other brands and products that employ the ingredient. According to Engelman, "it has always been a silent contributor in skincare products." She names Philosophy's Hope in a Jar Moisturizer ($39) and Skinceutical's Epidermal Repair ($72). The latter "contains beta-glucan derived from plants, which helps to maintain a smooth, healthy, and youthful skin appearance and promotes collagen building." It also "aids in skin healing from excessive sun exposure, rashes, mild burns, and wounds." This Missha product also utilizes beta-glucan to hydrate the skin. Since it's an essence, you should apply it right after you cleanse your face. The lightweight and low-viscosity fluid sinks into skin to hydrate, brighten, and nourish dull and dry skin. Since Missha is a Korean beauty brand, it's just another sign that beta-glucan could be the next buzzy skincare ingredient to take over in 2018. Either way, I know I'll be using it from here on out.